Soften your home decor look by tossing one of our halloween decorative pillows on a sofa, bed, or entryway bench! 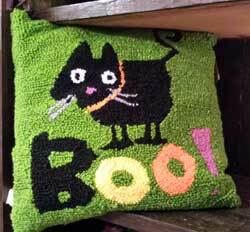 Black Cat Boo Halloween Pillow, by Hanna's Handiworks. This hooked yarn pillow features a black cat and BOO on a green background. Measures 11 x 11 inches. Made of cotton yarn. Jack Boo Halloween Pillow, by Hanna's Handiworks. 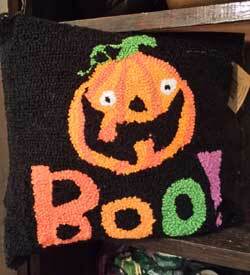 This hooked yarn pillow features a Jack o'Lantern and BOO on a black background. Measures 11 x 11 inches. Made of cotton yarn. 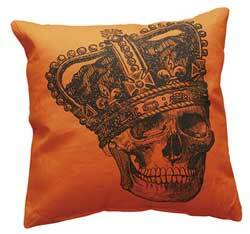 Crown Skeleton Orange Pillow, by Primitives by Kathy. Measures 15 x 15 inches. 100% cotton. Accent your room for the season with this decorative accent pillow! 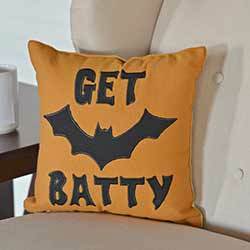 Features pumpkin spice orange cotton canvas with black bat applique, and "get batty." Accent your room for the season with this decorative accent pillow! 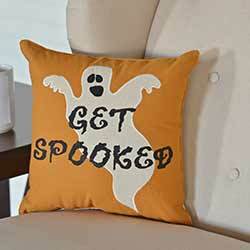 Features pumpkin spice orange cotton canvas with white ghost applique, and "get spooked." Accent your room for the season with the fun and spooky image of flying bats with this decorative accent pillow. 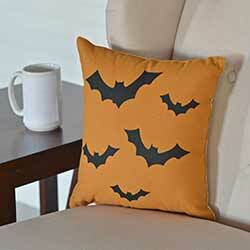 Features pumpkin spice orange cotton canvas with black bat stenciling. 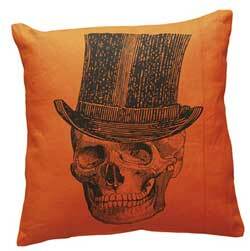 Top Hat Skeleton Orange Pillow, by Primitives by Kathy. Measures 15 x 15 inches. 100% cotton. Trick or Treat Halloween Pillow, by Hanna's Handiworks. Spooky decor for your living room, bedroom, or porch! Black hooked yarn pillow, with stars.